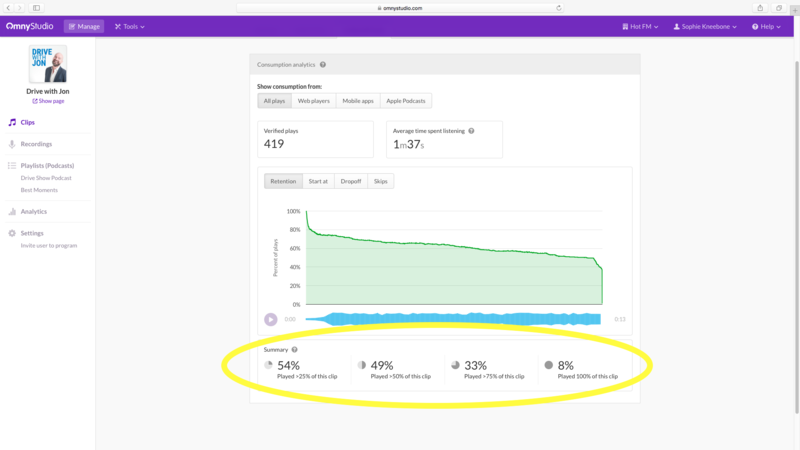 The complete guide to understanding Omny Studio's consumption analytics. Omny Studio offers consumption analytics on clip plays through website widgets and custom mobile apps. This means you can now see how people are listening to your show, and for how long. This document will take you through how our consumption analytics work and what each section means. 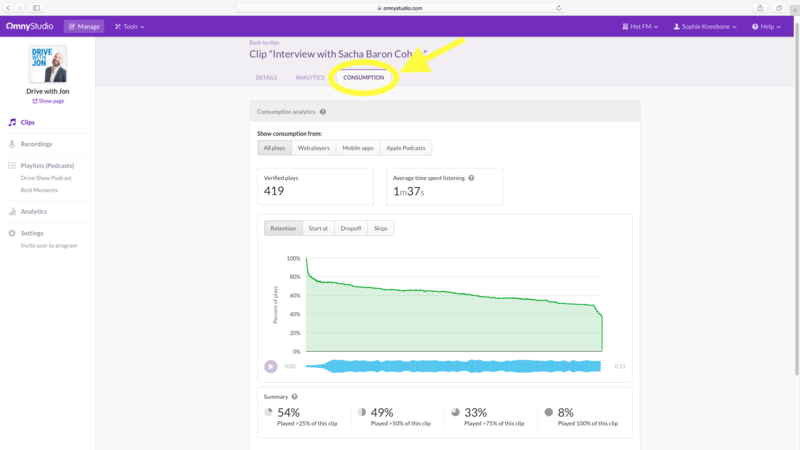 To view the consumption analytics for a clip, click on the clip anywhere in Omny Studio and go to the "Consumption" tab. Navigate to either "Web players" or "Mobile apps" depending on what you'd like to view the analytics for. The "Verified plays" section lets you know how many times the clip has been played through our embeddable widgets. If you hover over the green line graph underneath the total number with your mouse, you'll see how many plays occurred on each day. This is the average amount of time that each verified play lasted for. In other words, it's the average amount of the clip that was heard by a listener. Multiple plays of the same portion of the clip are only counted once. Here you can see which parts of the clip were listened to. If you hover over the graph with your mouse, you'll see what percentage of the verified plays heard that particular part of the clip. Here you can see where people started listening to the clip, so you can see at a glance how many listeners have heard the clip right from the beginning. Hovering over the graph with your mouse will show you the exact time stamp and how many people listens began at that point. Again, you can hover over the graph with your mouse to see the timestamp of that section and how many listeners dropped off at that point. The "Skips" graph shows where listeners have started to skip through the audio. This allows you to see whether there's any part of your show - for example, host-read ads - that listeners are regularly skipping over. Hovering over the graph at different points will show you the exact time stamp and how many verified listeners have skipped from that position. We can see that 54% of people played more than 25% of the clip in total, 49% of people kept listening and played more than half of the clip, and so on until we get to the 8% of listeners who played the clip all the way through.